NORTHERN NEW YORK BLDRS EXCHANGE, INC. It is the desire of the Exchange to operate in accordance with the best interests of the Membership. Therefore, observance of a very few rules will result in greater service to all. 1. PLAN ROOM REGISTER: Please sign the Plan Room Register each time you (or your agent) use this facility. This helps to keep you informed of last minute addendums. 2. CONDITION OF PLANS & SPECS: Please do not check with pencil marks when making take-offs. Check marks create a serious condition for other estimators; and of course, kindly do not write on the plans or in the specs. 3. ORDER: It is especially important that addendums and loose sheets be prevented from becoming separated from the specs. Copies of materials can be made in the Office at a cost of $.15 per copy. Engineer copies may also be made ranging in price from $3.00-$4.50 depending on size. Please sign in the number of copies made and company name. 4. NON-MEMBERS: Plans and Specs are not available for use by non-members on a regular basis. 5. QUIET: Please, out of consideration for others, work quietly. 6. OVER NIGHT: No plans and specs may be removed from the Plan Room. Door codes are provided so that members may use the Plan Room after hours and on weekends. Failure to follow this rule will result in loss of Plan Room privileges. 7. COOPERATION: Plan Room users are required to cooperate with one another during peak periods so that all may have the opportunity to use the Plans and Specs for a particular job. 8. 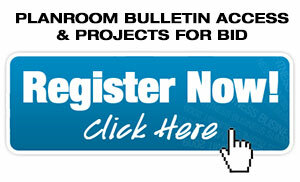 BULLETIN: Please read your weekly Plan Room Bulletin for upcoming projects. 9. COMPUTER: A computer is available in our plan room for members to access the Electronic Plan room free of charge.